The Hoka Clifton 3 is like running on miles of fluffy white clouds, without falling through them. 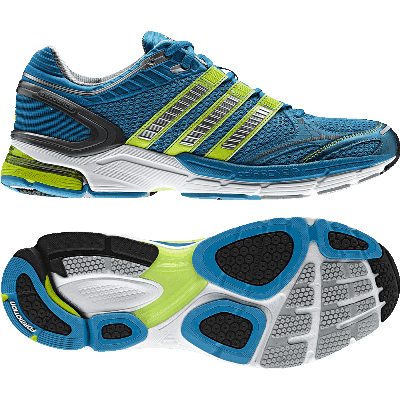 This road running shoe has quickly made it to my frequent rotation of shoes as it provides tons of cushion, a great fit, and is light on my feet. Fluffy White Clouds… The Hoka Clifton 3 follows in the footsteps of many past Hoka running shoes in that it has a moster midsole compared to traditional running shoes, yet it is lightweight and provides an unparalleled level of cushion. The second you can get over the goofy looks of a big midsole, you will fall in love with the amount of cushion provided in the Hoka Clifton 3. The midsole has a slight rockered shape to the shoe where the front and back of the shoe have no contact with the ground when on a level surface. This shape I found provides for a smooth heel to toe transition. The heel to toe drop of the Clifton 3 is 5mm, which could bother someone who usually runs in a traditional running shoe which has a usual 10-12mm heel to toe drop. 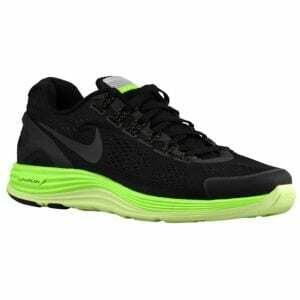 Most of today’s running shoes range between 6-10mm in the heel to toe drop category. That said, you won’t really notice the an extra 1mm or two of drop in the Clifton 3. On the roads, the Clifton 3 rides like a Cadillac but has the weight of a Ford Fiesta. While the oversized midsole looks like it would add a lot of weight, this material is often some of the lightest material in a shoe. In total, the Clifton 3 weighs in at 8.6 ounces which is lighter than many of the “lightweight” running shoes on the market. The outsole of the Hoka Clifton 3 focuses on the areas of impact. The shoe only has a layer of outsole rubber on the back of the heel and the forefoot of the shoe. 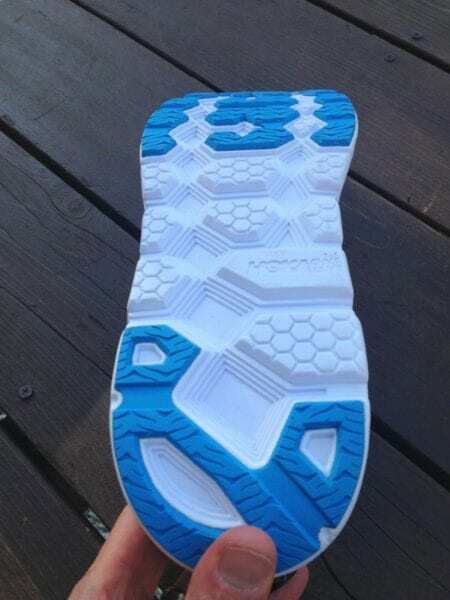 The mid section of the shoe has no outsole rubber and shows more of a beating than your standard outsole rubber. Having put a couple hundred miles on this shoe, I have absolutely no worry about the Hoka Clifton 3 shoe bottom not lasting or performing as intended. 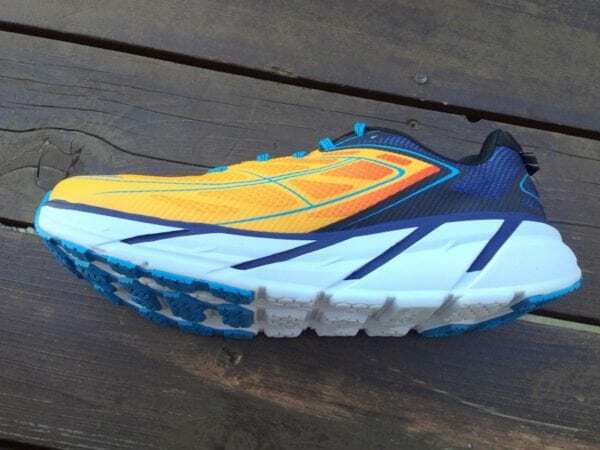 The upper of the Hoka Clifton 3 running shoe feels more like an upper of a minimalist running shoe, this is a compliment. Having tested hundreds of running shoes over the years, The upper of the Hoka Clifton 3 is one of my favorite fitting shoes. The upper is durable enough to last through 500+ miles or running, but it’s not completely overbuilt. It uses a welded overlays compared to stitched which helps shave weight, but still provide the needed structure. The forefoot offers plenty of room for your toes to move around, but not to the point where you’re swimming in the shoe. The lacing system and heel cup snugs your foot into the shoe eliminating any possibility for heel slippage which translates into no blisters on the heel(assuming you’re wearing decent socks). 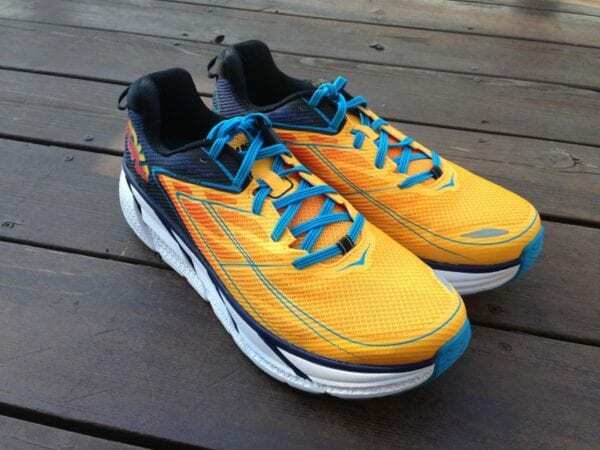 I’ve been able to use the Hoka Clifton 3 in nearly every type of running environment. I’ve logged plenty of road miles and this is where the Hoka Clifton 3 performs best. While you would think an oversized running shoe might be too clunky on track workouts, this shoe performed great on 400m + distances. For sprint workouts, some runners might opt for a lightweight trainer where the extra shoe won’t have the option to get in your way. In my own experience, I’ve done a number of track workouts including 200’s and found there to be no problem, but I am your typical distance runner with not a ton of speed. If you want to get out on the trails with the Clifton 3, you won’t be disappointed. I’ve run plenty of technical and non technical trails with this shoe and have been very happy with the performance. 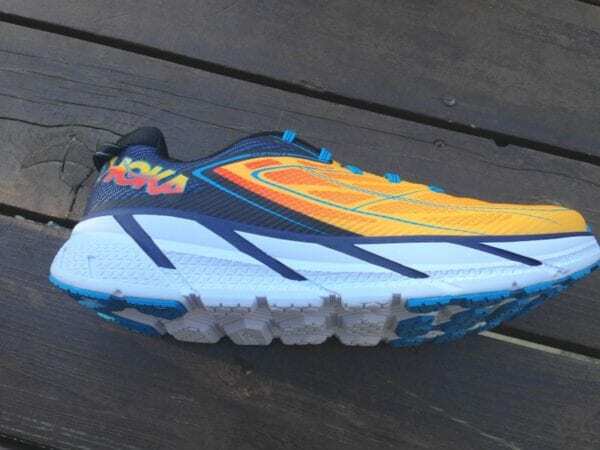 If you primarily run trails, I suggest going with a more trail focused Hoka such as the Speed Instinct reviewed here as this will offer more traction and the outsole will hold up better. Whether you’re an ultra marathoner or an occasional 3-5 mile runner, the Hoka Clifton 3 is a fun shoe to run in. This shoe has the perfect amount of cushion while remaining very lightweight. The fit of the shoe really brings it home as this shoe fits like a glove. 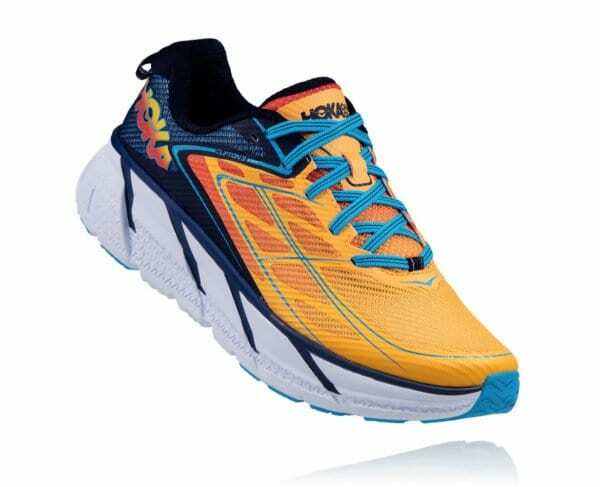 For more information, visit Hokaoneone.com.